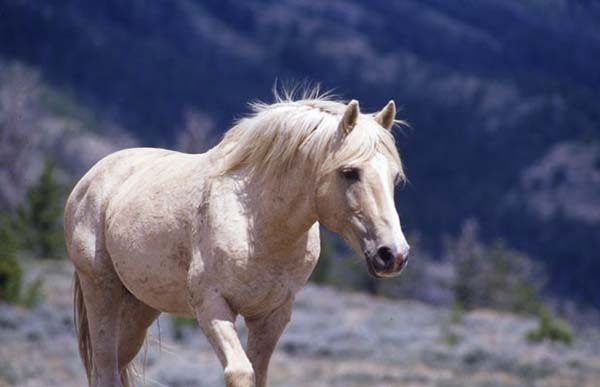 Cloud is a pale palomino wild stallion who lived in the Pryor Mountains on the Montana/Wyoming border, a range the Crow Indians called the Arrowheads. Cloud was been documented from the day of his birth until his presumed death by Emmy-winning filmmaker & TCF’s Executive Director Ginger Kathrens. Her films about Cloud, “Cloud: Wild Stallions of the Rockies,” “Cloud’s Legacy: The Wild Stallion Returns,” and the latest film “Cloud: Challenge of the Stallions” aired on PBS’ Nature series and represent the only continuous documentation of a wild animal from birth in the Northern Hemisphere. Ginger’s chronicles of Cloud have been compared to Jane Goodall’s work with chimpanzees in Africa. She has also written three books about Cloud. Cloud disappeared in late 2016 and his body has never been found; appropriate for a legend. The pale, flashy mustang is the son of the elegant black stallion, Raven, and the bright palomino mare, Phoenix. Cloud represents a rare color in his Pryor home, which is why he has always been released, despite being rounded up numerous times. However, many of his family members have not been as lucky and have been removed by the Bureau of Land Management (BLM) through either helicopter stampedes or bait trapping operations. In the spring of 2011, Congress declared Cloud an ambassador for all wild horses living in the American West. 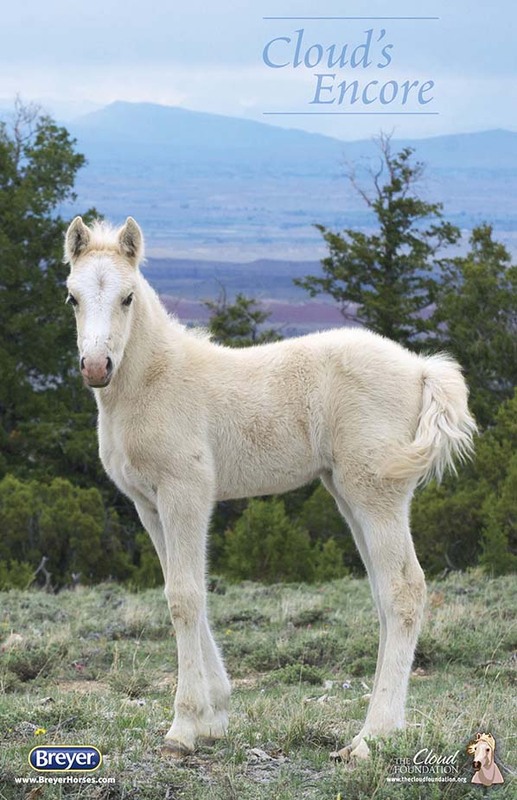 Cloud and Feldspar’s daughter, Encore, was born on May 6, 2013 in the Pryor Mountains. "I’ve had many wondrous experiences on Cloud’s sacred mountain over the past 20 years, but the discovery of this fragile filly who grew into a precocious and athletic yearling ranks as one of the very best," Kathrens said. Her life has been documented thoroughly in our Pryor Journal. Encore has an almost mystical effect on those who have had the pleasure of being in her company. Her theft by bachelor stallions when her father was injured in May of 2014 was emotionally wrenching for all who had enjoyed watching her with her family. You can read more about the “Courage of Cloud and Encore” here. Today, Encore lives wild and free with her stallion, Knight, and her companion mare, Outlaw Lady, on the same Pryor Mountain land that her father once roamed. How her life will turns out is anyone’s guess, but she is Cloud’s daughter and courageous beyond imagination. Your purchase of Encore’s exclusive, limited edition, signed and numbered print, her new card set, or any other items in our Cloud Store, are timeless, tax deductible gifts that make a real difference. Your purchases and donations help us to continue to educate and advocate for all our wild horse families and their right to live in peace and precious freedom on their home ranges in the American West.